Visit Our ebay Site Too! FREE STANDARD UPS SHIPPING FOR LOWER 48 STATES! Enclosed Full Voltage magnetic starters are the most commonly used devices to switch AC motor loads. 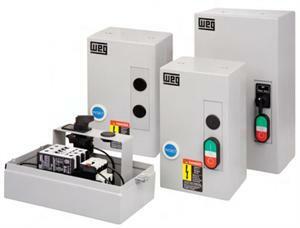 WEG’s non-reversing and non-combination starter consist of a contactor and a bimetallic overload relay assembled together inside a NEMA type 1 enclosure. Two optional pilot devices are available factory-mounted. Either START / STOP pushbuttons or no-pilot device on the cover are on the shelves ready to go. Field Kit modifications are also available as accessories.